The collapse of traditional manufacturing has hit Trumbull County as hard as any place in Ohio. Drastic cuts at the GM plant in Lordstown have many trying to figure out if the economic pummeling will continue -- and if there are alternatives. Manufacturing’s stunning decline is seared into the DNA of Trumbull and Mahoning counties: It began with Black Monday, the single day in 1977 that cost 5,000 steelworkers their jobs. And an analysis by Your Voice Ohio shows the losses have continued into the 21st Century. Since 2000, Trumbull has lost nearly 40 percent of its total payroll -- a whopping $1.7 billion. Two-thirds of manufacturing jobs are gone. So people here are watching warily as the GM plant in Lordstown has dwindled from three shifts to one. People like Tommy Wolikow and Rochelle Carlisle. For them, the sprawling complex GM built 50 years ago represented security -- worlds removed from the rusted shells of steel mills in Youngstown and Warren. Carlisle remembers when she was hired in. Sure it meant temporary status for as much as five years. But the close to $20 an hour was nearly twice what she made as a pharmacy tech. Rochelle Carlisle with her daughter, Bella. 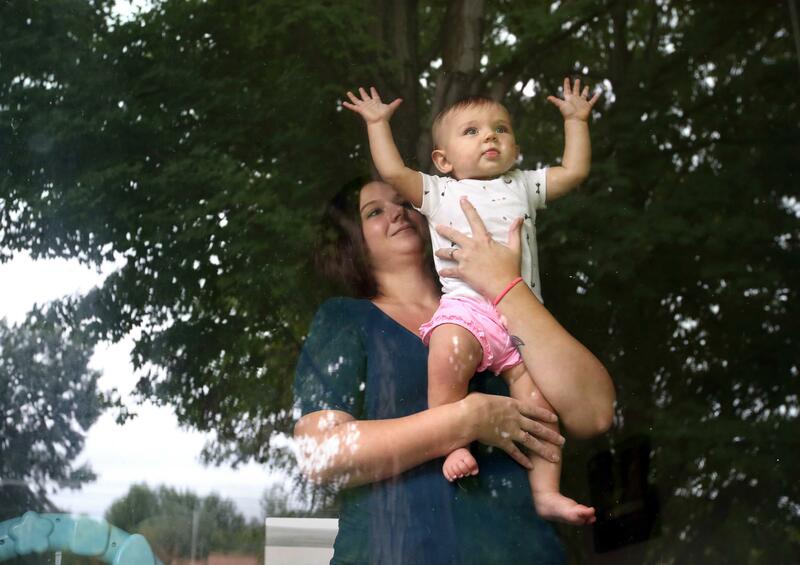 Wolikow and Carlisle met at the plant, got engaged and bought a split level just 2 miles away -- one with a treed yard, good schools, a safe neighborhood for their blended family of five, including now 9-month-old baby Bella. It seemed like a good bet. Over the decades, Lordstown had its cutbacks, strikes and shutdowns. But it had come barreling out of the great recession with a new labor contract, a $350 million retooling and the launch of the Chevy Cruze. So even when 1,500 third-shifters -- including Wolikow and Carlisle -- were laid off in January 2017, they weren’t terribly worried. It’s coming up on two years now. In June, the second shift was cut, too. The assembly line at Lordstown's GM plant. The problem is sales of the Cruze have plummeted. It’s a highly rated, fuel-efficient sedan in a day when consumers - buoyed by low gas prices -- want SUVs. GM hasn’t provided specifics about plans for Lordstown. Spokesman Tom Mock notes that Chevy invested another $200 million to retool Lordstown for the second-generation Cruze, says it remains committed to compact cars and pledges that Lordstown will continue to operate. But the cuts have cost the village of Lordstown more than a million dollars in taxes; and schools Superintendent Terry Armstrong says Lordstown has lost a piece of its future, too.. I thought this is going to be a job where I'm going to be able to put money aside for my daughter’s education, for her first car. “We’ve had families that had to move. You see students who are here their whole lives and they are excelling, but to be able to put food on the table they’re leaving," Armstrong said. Tommy Wolikow and Rochelle Carlisle have a daughter, Bella, together. They are a blended family with children from previous relationships whom they'd have to leave behind if the had to move. Tim Francisco, head of Youngstown State University’s Center for Working-Class Studies, says family connected-ness is a core value of communities like trumbull. So Carlisle, Wolikow and others in the community are fighting to keep jobs here. 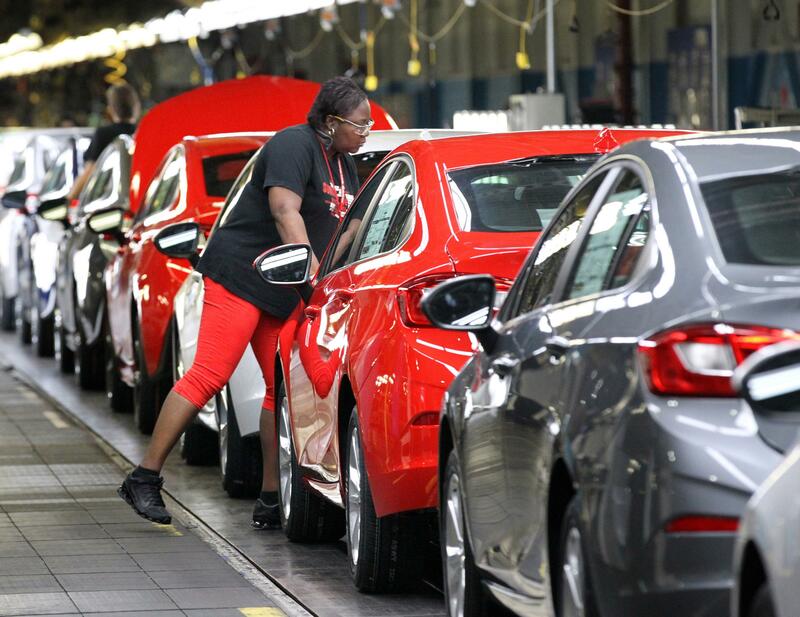 The union held a rally last month with Good Jobs Nation to try pressure GM to move models to Lordstown from overseas and to challenge national trade and tax policy to stop off-shoring. Local union President David Green says the concern extends beyond Lordstown. Wolikow and Carlisle also have taken their case to President Trump. They travelled to rallies in West Virginia and Minnesota to deliver letters to the president’s campaign manager. But mortgages and credit-card bills won’t wait for big policy changes. So Wolikow used his roughly $15,000 in federal retraining money for diesel mechanics and truck driving. And Carlisle is waiting tables for $4.15 an hour -- plus tips. GM’s Lordstown plant is down to one shift starting tomorrow, as the plant faces a downturn in demand for the once-best-selling Chevy Cruze. Lordstown lost its third shift last year, and earlier this year, GM said it was cutting about 1,200 workers on the second shift. Ohio’s unemployment rate has dropped again, to a level not seen in 16 years. The state’s jobless rate for April dropped to 4.3 percent, which is the lowest level since July 2001, when it was a tenth of a point lower. That edges the state closer to the national employment rate of 3.9 percent. Northeast Ohio economist George Zeller says the latest numbers show more job growth in Ohio in the first four months of this year than in all of 2017, which was the weakest job growth year since the Great Recession.